Mark Thomas Gibson was born in Miami in 1980. He received a BFA from Cooper Union and an MFA from Yale in 2013. He has been included in numerous group exhibitions, and most recently co-curated with William Villalongo Black Pulp! at Yale University Art Gallery. 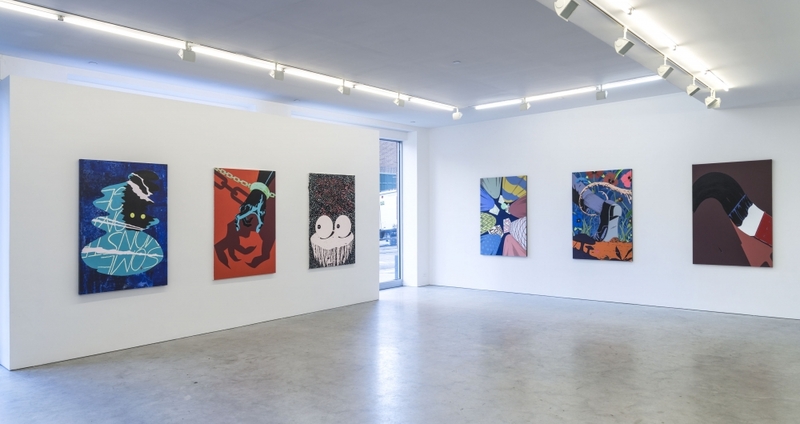 His current solo exhibition at Fredericks & Freiser runs until April 23rd. The exhibition is accompanied by the publication of Some Monsters Loom Large with an essay by Robert Storr. RH: Your work plays with the language of comics and pulls it into painting. How do you see these two worlds interacting? MTG: Thank you for referring to the style as a language. I think people can get caught up on the surface of things, and don’t question my choice to perform this way. What most people refer to as comic book or cartoony is in fact a marginalized art form. Even though this form is ubiquitous in our culture, it is still seen as low art, of low value, or juvenile. I am a marginalized person that is deemed to have lesser value in this culture. I also have a knack for making things look comic book-like. It makes sense for me to use this language when making work that describes my interior life. There is a type of historical privilege and power to painting. I enjoy housing my work in a space not typically comfortable with ideas of lesser value. Developing my drawings to a place where they could become paintings was a major goal for this exhibition. RH: You’ve produced a narrative book of drawings that is central to this new body of work. Can you give the basics of the story, and talk a little about how the book functions? MTG: Basically the main character is a wolf-man. When we meet him, he is on a desert island sunning himself and slowly going insane. One day he witnesses an event in the ocean and investigates. He finds a large stone mountain-like structure with horns that has popped out of the ocean. He climbs inside and his adventure begins. Through a small theatre production, he is told the basic history of western colonialism and the creation of America, and about how he came to be a wolf-man. He is shown how the cannibalism of Native Americans by Pilgrims in the founding of this country was responsible for birth of an evil curse/spirit named “Manifest Destiny”. This curse infects all who come in contact with it, transforming them into wolf-men as well. Throughout the story, the main character is chased down and murdered by manifest destiny several times, ending each volume. I really want every drawing in the book to stand alone as well as be a part of a larger narrative. I rely on a lot on the viewer’s ability to discern what is going on in the book. There is a language I hope to develop image to image. RH: The paintings are so developed and nuanced. The color and information are far more complex than what we expect from full color comics. MTG: Yeah, I carefully chose which of the drawings from the book would become paintings. It took a while to decide which I thought could translate, and also what it would look like in a room with a series of paintings. The whole mood I wanted to create was planned out. When executing the paintings, they become all about color for me. I design them so that color can be the main concern. I try to use the painting to play against the imagery found in the drawings. People tell me how pretty they are, and in the next sentence they ask, “when is the world going to end”? I want them to have the allure of pop and comics while speaking to a certain type of horror and fear. RH: The cropping and specificity of your paintings are striking. How do you decide where to crop? MTG: I think a lot about cinematic space in dramas and horror films when I am making the drawings, and even to a greater extent when deciding which will become paintings. I have to feel that this thing can hold the weight of being painted. Will they be fun to figure out how to make into a painting? When I draw, I watch a lot of black and white noir films like The Killing by Kubrick or early Alfred Hitchcock films. When I think about the crop, I think about freshman year high school 2D design. I had a teacher named Randy - that dude was always talking about the crop. His whole philosophy was about the crop. He had a nasal stoner hippy voice, sort of a thick red wavy haired Shaggy sans Scooby vibe. Randy would look at your piece, rub his goatee and say, “Crop it”. “Crop it” meant being in state of recognition about what you were making. RH: They feel tied to a specific era of comics, maybe late 60’s early 70’s. But I would guess you have a long list of influences. MTG: I am always pouring over books and references. There was this tapestry show a year ago at The Met called The Grand Design, featuring the work of Pieter Coecke. I kept walking out and going back - I couldn’t get over the scale and detail, as well as the death and gore. That really inspired me. I was also fortunate to go to Paris last year. I kept seeing grand history painting, where war and death wasn’t shied away from. The Raft of the Medusa, and the Marie de’ Medici cycle by Rueben’s floored me. Maybe because of weighty art school history, all of that stuff informs me as much as comics. I think Will Eisner, Winsor McKay, Kirby, Mignola, The Hairy Who, Guston, Goya, Polka, Hancock, Pippen, Ad Reinhardt, Hokusai, and Moebious were big influences on this body of work. RH: Yeah, in your show, I was thinking about canonized dramatic painting in relation to comics. Goya and El Greco, but also people like Signorelli and Tintoretto. MTG: Wow Tintoretto, its kind of funny you actually pulled out that name. At the Musée du Louvre I saw Tintoretto’s Paradise, it was in the same room as the Mona Lisa. This epic painting of the heavens sprawled across the wall, with no one in sight to view it. While 20 feet away people are climbing over each other, crushed up against a railing so they can take a selfie with Mona Lisa. The Tintoretto painting was completely overshadowed by hype and recognition of the Mona Lisa. I feel that way about some comics in relation to fine art- the medium has gotten bad press. If you look at the 20th century in painting, comics pop up everywhere. Anyone who takes issue with comics is suspect. RH: So who are your comic artist heroes? MTG: Dwayne McDuffie as a creator is a hero. Jim Steranko is also a hero because he pushed what comic books could do visually as well as physically. I could go on and on about this stuff. I think my heroes can flip pretty fast. No one person stays on top of the heap for long. I walk through a comic book store like a museum- you can find gems everywhere. RH: In a recent podcast interview with Michael Shaw, you talked about empathy, and how it’s required for viewing and understanding art. I think about that a lot. Did you always have that perspective? MTG: I still haven’t listened to that podcast. I get freaked out listening to my voice. No, I didn’t think empathy was important when I was younger. I just don’t think I was aware of it. I was ignorant, and thought intelligence was the only muscle that needed flexing when looking at art. I had a rigorous but ignorant upbringing with art. There where so many bad blanket-judgments made on what constituted art. It was more of a reflection on my education than the actual art world around us. This point of view was mainly formed during high school. It took a lot of time away from art to come back to it with more empathy. RH: Did it change the way you think about what you make? MTG: Totally. I think for a long time I made work about what I felt was a shared history. Historical events that effect the way our world works today. Now I realize that the feelings I have around living in America are a shared experience. I started to see that when I addressed my more personal concerns, others could relate. For friends of mine, comics were a kind of young male melodrama- a space for emotion, longing, pain, and confusion. It’s interesting that in painting, it’s the expressionists associated with stereotypical male feeling. And comics are clearly more flat, more pop, more planned..
Comics get to the point by cropping and emphasizing parts of the image world. Not to over dissect my own work, but as an example, I have a painting titledWarpaint, depicting a large brushstroke. Near the end of the book, the wolf-man sees a protest and decides to join. So he grabs a paintbrush and some cardboard. The drawings operate like an 80’s action training montage, where the main character readies him self to do battle. I saw a similarity in that moment and the photos of Pollock dipping his brush into the bucket of paint. It doesn’t have to be Pollock, but to your point, I think it’s a really succinct gesture. I actually think a lot more about Alex Katz when I am painting. I am not trying to activate my emotions or feelings around a subject. I accept that they are already there when I paint. When Guston went back to figuration, it was partly because he felt people where not talking about America in their work. I think I want people to understand that I am afraid of the way the country is headed socially and politically. It’s not so much the feeling of being a black man in America I want people to empathize with, its more the fact that we actively live in a society that condones that threat to my life. RH: Do the monsters in your drawings represent this societal threat? Or is there another analogy for the monster? MTG: The monster is American Culture at large. I refer to it as a curse or virus because I want it to be understood that we all share in this monster. We are all performing in the midst of this monster. I know that sounds broad but people are feeling it. RH: We talked about influences. Is there someone you love unconditionally, even as your tastes change or shift? MTG: I can’t say I have ever really seen a bad Kerry James Marshall. His abstractions at the last Venice Biennale where incredible, some of the best painting I have ever seen in acrylic. I have real unconditional love for Jacob Lawrence. I can always keep going back to it. Alex Katz almost has the same thing, but not as regular. There are a lot of good Alex Katz paintings but a great one is pretty shocking. They work like a really good slight of hand magic trick. Jack Whitten is an innovator and I am surprised you don’t see his work in more group shows, especially during the abstraction boom of the last few years. Strangely, history rarely allows black and white artists to share the same the space. There are so many interesting overlays between black and white artists who knew each other and taught at the same schools. Where is my Jacob Lawrence, Ben Shahn, and Kathe Kollwitz social realism show?